From Arequipa, we bused to our favorite town in Peru (I’m being facetious) – Puno. 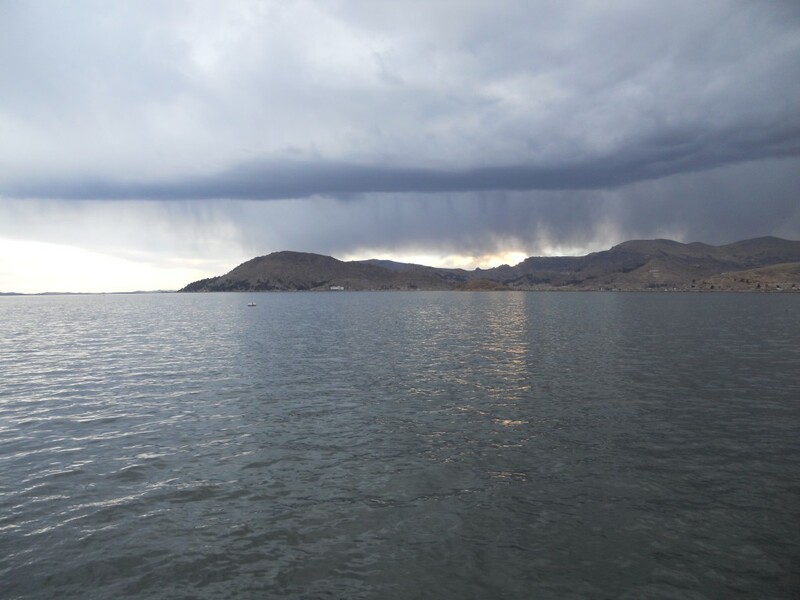 We arrived just in time to watch a storm roll in over Lake Titicaca. The next day we got up bright and early to start our journey across the border. 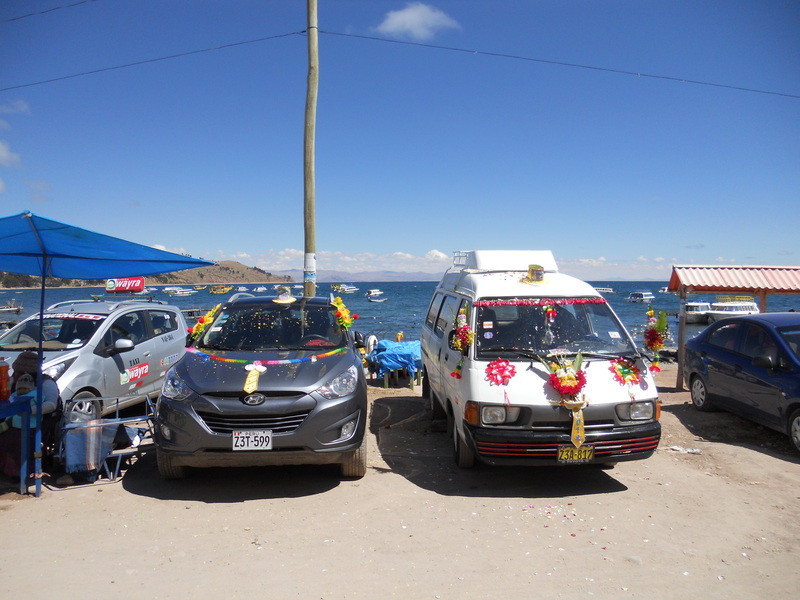 Our bus trips between Mancora and Lima and then Lima and Arequipa were expensive ($45-55) so we were pumped that the bus to La Paz was only $12! 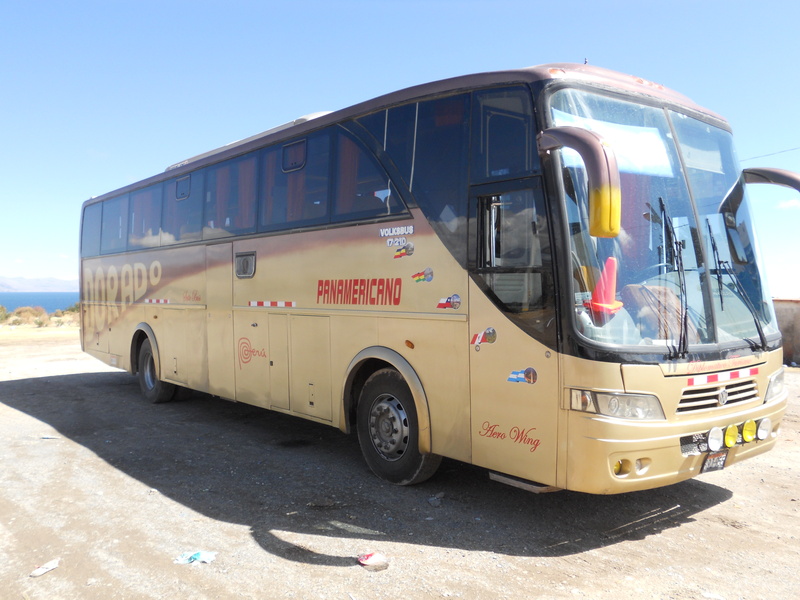 Here’s our bus that pulled out of Puno at 7:30am. It was actually really nice! 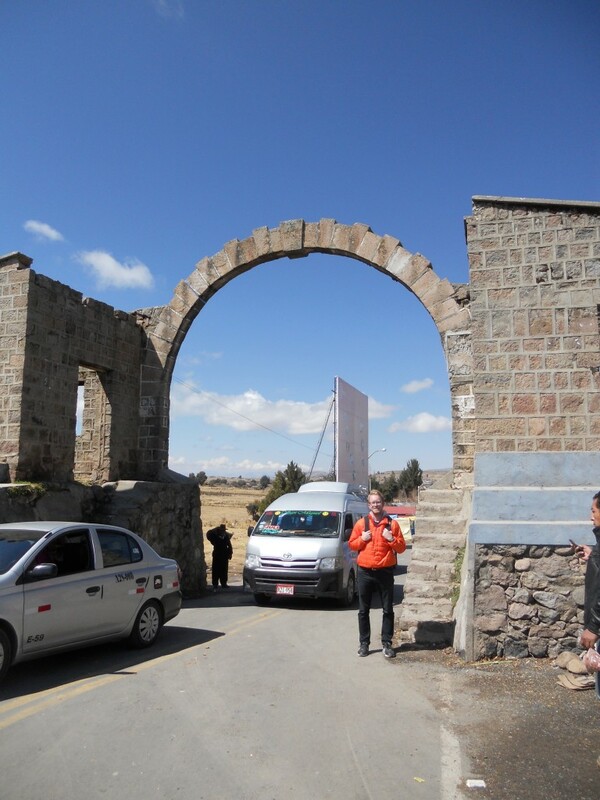 The border crossing we did a few weeks ago from Ecuador to Peru was very simple. The bus stopped at the border and there was one building that had officers from both countries. So we got into the Ecuador line to get our passports stamped out and then went to the Peru line to be stamped in. Very simple and it took 10 minutes, including filling out the entry paperwork. 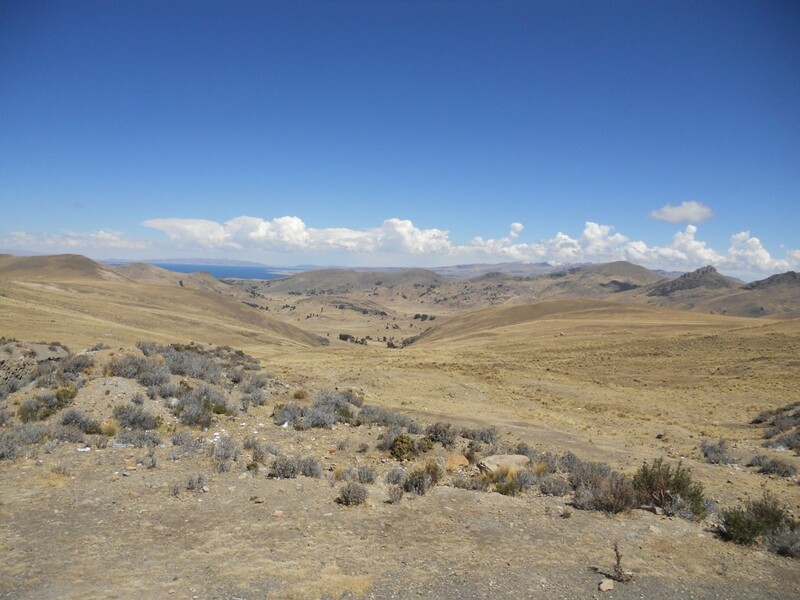 The crossing into Bolivia was a lot more fun! The bus stopped just before the border and everyone had to get out. 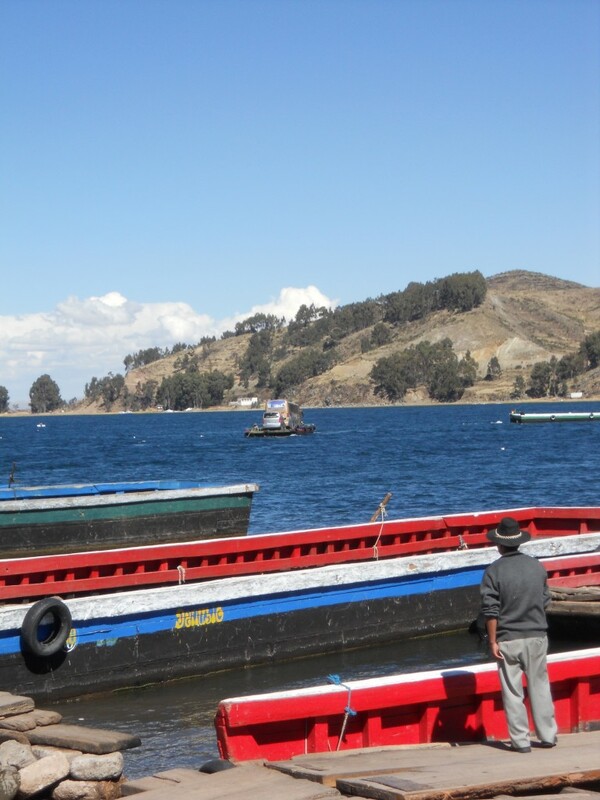 There were money changing stations to trade soles for bolivianos and then two offices to visit – the police and then immigration. 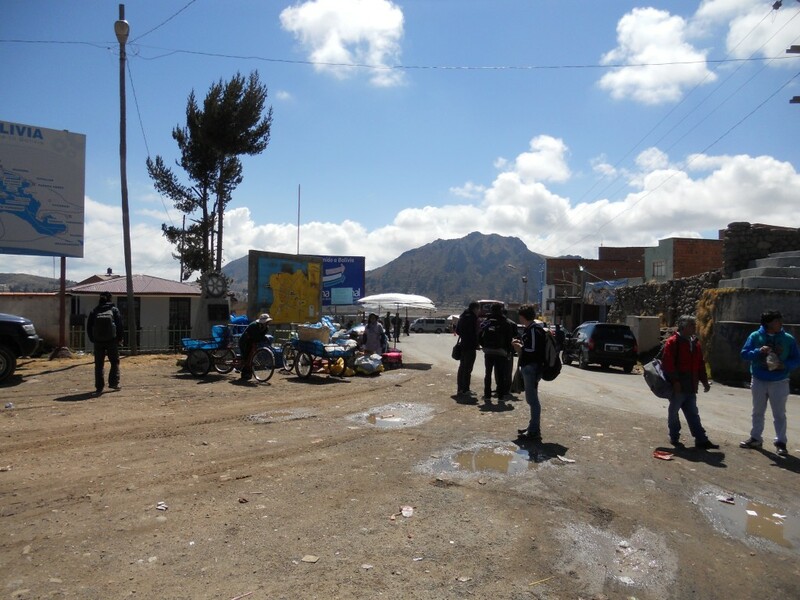 Once we were stamped out, we had to walk across the border into Bolivia. Here we are! Then it was on to Bolivian immigration. 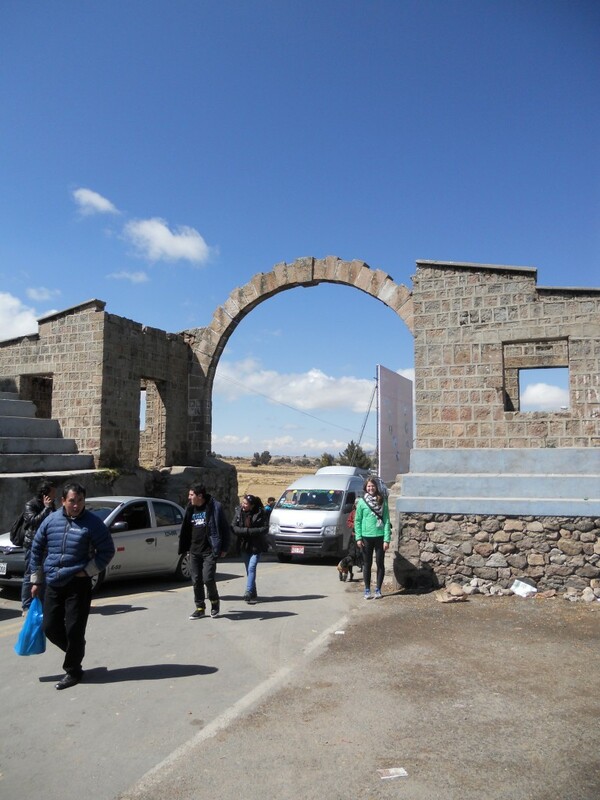 Since we are Americans, we had the pleasure of skipping the long lines for travelers entering from other North/South American countries and got our own private line – the kind of private line where you have to pay an additional $135 visa fee. We, along with one other couple, were the only ones from the U.S. crossing, so we were in and out pretty quickly. So then we had to wait around for the rest of the bus to get their stamps. At least it was a nice day! Once we were back on the bus, we headed to the town of Copacabana, a few minutes down the road. 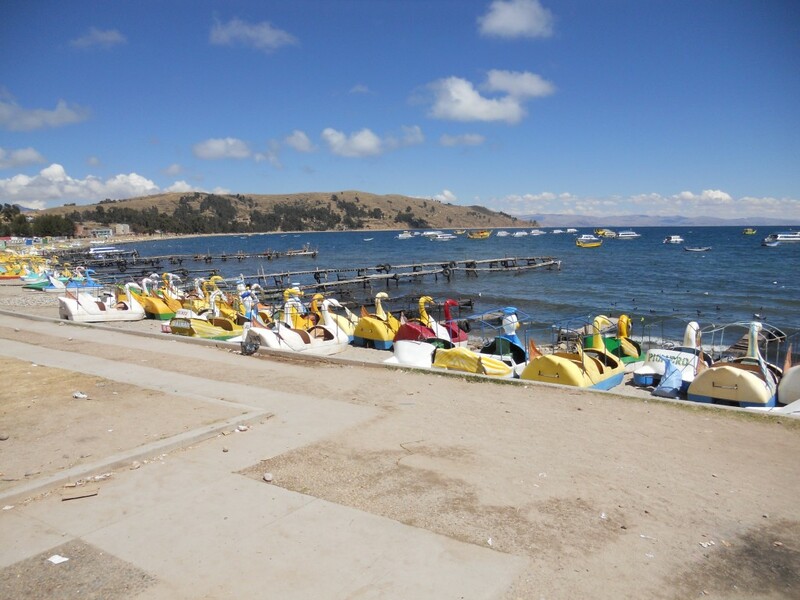 Copacabana is right on Lake Titicaca, and from everyone we’ve talked to, the better place to visit the Lake than from Puno on the Peruvian side. The town was pretty cute and for some reason, a lot of the cars were decorated with hats. We had a hour to kill in Copacabana before switching to a different bus to complete the trip to La Paz. There were some beautiful views of the lake as we drove. 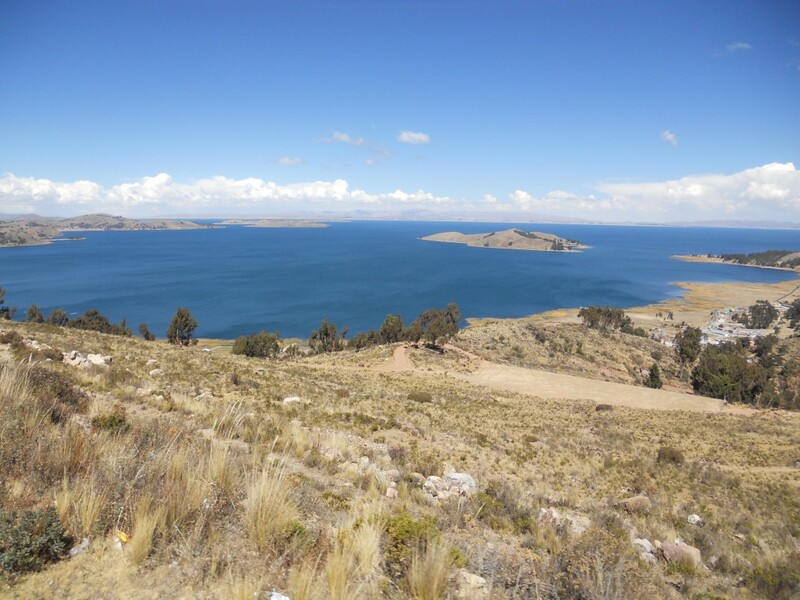 About an hour outside of Copacabana, the bus stopped and we had to do a “ferry” crossing to get across the lake at a very narrow point. All the passengers crowded onto a few boats and then waited on the other side as the bus (with all of our stuff) was driven onto a barge/raft thing and floated across. Our gold bus is floating across in this picture with a grey van. After that, the rest of the ride was fairly uneventful. 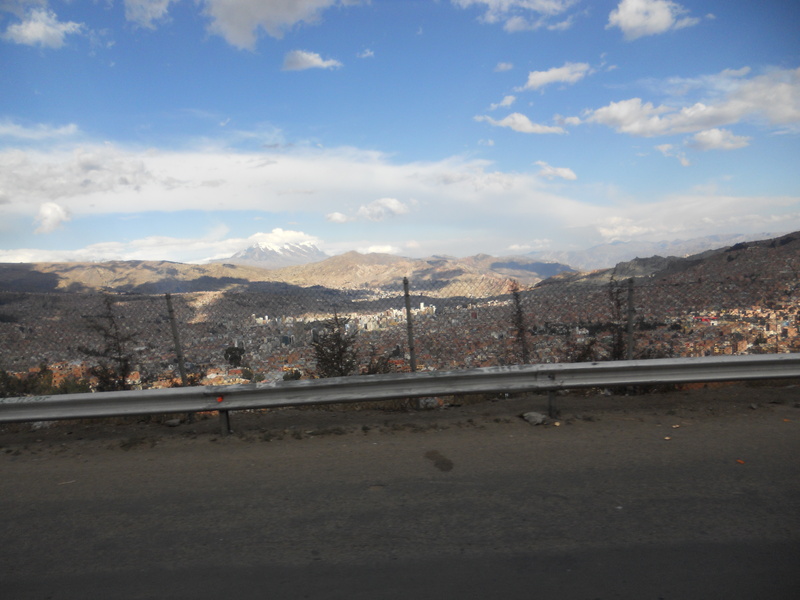 Here’s a picture of our first glimpse of La Paz as we finally got in around 5pm!